Can you kill the mad AI that tries to take over all the computers in the world? Can you stop the coming end of the information space? 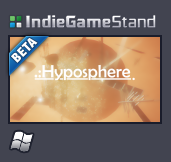 The game “Hyposphere” tells the story of the battle of humanity gone mad with artificial intelligence. Manage probe and go a hundred levels in a new arcade puzzle game. Abstract picture drawn by crazy mind of the computer and excellent graphics will not let you get bored. Buyers beta version of the game will receive all future additions (network mode and all the DLC) for free. Bonus content and new bonus gamemodes will be avilable only for beta users. The game is updated every week. Adds new levels and game points. Online table of records will appear in an upcoming additions. Compete with the world! 2 cores cpu 2.3 GGZ or better. Optimisation process in progress. Release version will be more faster. Hyposphere VR was released for Oculus Rift! Today hyposphere VR was released for Oculus Rift in the Oculus Store! Many changes and true marbble ball VR expirience. After months of developement process we are coming to steam. Thanks all for support. Hyposphere fully completed! We are on steam greenlight. Please vote for our game to see this project on steam. Thank you!